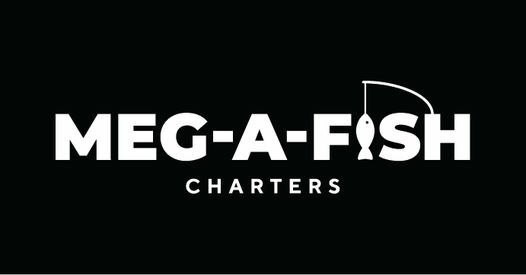 We are a Muskegon charter fishing boat service from the great salmon fishing port of Muskegon, Michigan. Muskegon is known for it's beautiful beaches but also Muskegon charter boat fishing for trophy Salmon and Steelhead. Whether you come by the Lake Express Ferry or your car you can enjoy a professional Muskegon charter boat fishing trip out of Muskegon with experienced charter Captains who have more than 70 years of Coast Guard licensed professional charter fishing experience hard at work for you. 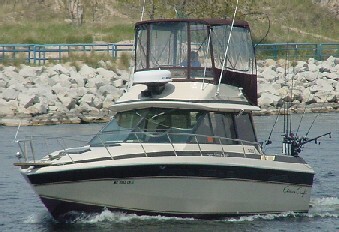 We have been a licensed Muskegon sport fishing charter service for over 40 years. We rank as one of the oldest charter boats services in the state of Michigan and the oldest longest running in Muskegon! I grew up charter fishing out of Muskegon and other ports in Michigan with my Dad. I received my captain's license at the age of 18. My son received his captain's license at 18 as well. Now my daughter crews on our charter boat and plans on getting her captain's license at 18 too! We have 3 generations of experienced charter captains catching fish for you. Bring family, friends, employees, or customers for a fun day of hot Muskegon Charter boats fishing action while in total comfort and safety on our beautiful Chris Craft with an overall length of 37 ft. and all the comforts of home. You could say “it’s like fishing in your living room”, only fishing off the great port of Muskegon. See us on TV! We were the featured business on Under the Radar Michigan an award winning TV show. Let our family take you on a Muskegon sport fishing trip for master angler King Salmon, Coho Salmon, Steelhead, Brown Trout, and Lake Trout. There’s nothing like a powerful Salmon tearing off hundreds of yards of line in seconds on its way to Milwaukee or a beautiful Steelhead dancing on top of the water. We would love to share this excitement with you. Stay a while and see what else Muskegon, Michigan has available in addition to over 40 years of charter fishing experience at your disposal with the crew of the Margie J. All of which is focused on providing you with exciting fishing memories that will last forever. 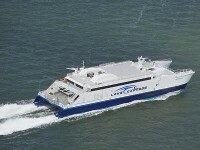 We are located at Great Lakes Marina where the Milwaukee-Muskegon Lake Express Ferry docks. Give me a call and let's go fishing! Kids 6 and under go FREE! The Lake Michigan port of Muskegon, Michigan not only has great salmon fishing but much more to offer. Click on the link below and find out what's happening while you're in our beautiful town.